Mount Semeru Summit is the highest active volcano on Java island which became a favorite location for trekking | climbing. While Mount Bromo is a active volcano having a vast sea of sand and bromo crater that exotic located and also very famous with the beautifull sunrise. 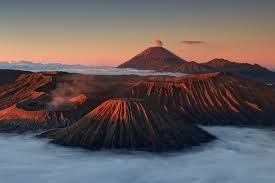 Bromo Midnight Tour will start when our team pick up you at surabaya airport. and then then, drive to Cemoro Lawang or Sukapura village for 3 hours driving. Take a rest in jeep parking area before go to penanjakan view sunrise point. Get the parking lot at Sea of Sand, start trekking to Mount Bromo Crater for 30 minutes or take the horse riding transportation for 15 minutes then trek up through the stairs for amount 250 steps. directly go to Ranu pani.via jemplang and then stay one night in there. Wake you up to have breakfast an early morning then check out from your hotel , we drive to Ranu pane Village 2100 m for 2,5 hours driving by the jeep. After get ranu pane submit medical check entrance fee and start to semeru trekking tour for 10 km or 4 hours to ranu kumbolo with your porter have rented before. Arrive in Ranu Kumbolo, then having lunch and short break. Early morning weka up at (00.00) then you will start climbing to the mount semeru summit (3676) via arcopodo village (2900m) and vemoro tunggal (3200m)reach the crater's rim in 4 hours, enjoy the sunrise and view until satisfied taking photo from the crater and taking rest. then trek down to kalimati base camp for 1,5 hours to have breakfast. and than back to surabaya. For detail Bromo Midnight Tour Semeru Trekking Tour from Surabaya, Tour packages price, Accomodation, Jeep transportation rentals And also Bromo Tour Organizer you can visit our contact.